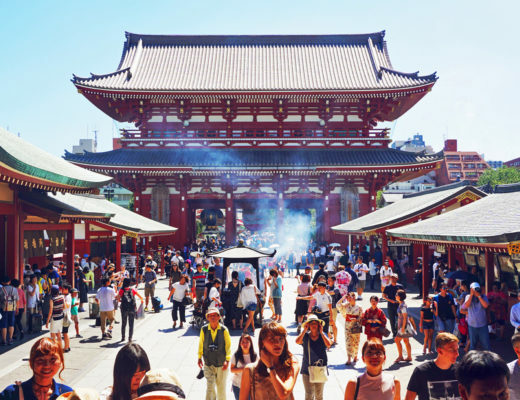 When I arrived in Japan, the lack of space that comes with dorm life surprisingly wasn’t the hardest change I had to deal with. Instead, one of the things I came to miss most about Australia was actually my oven! 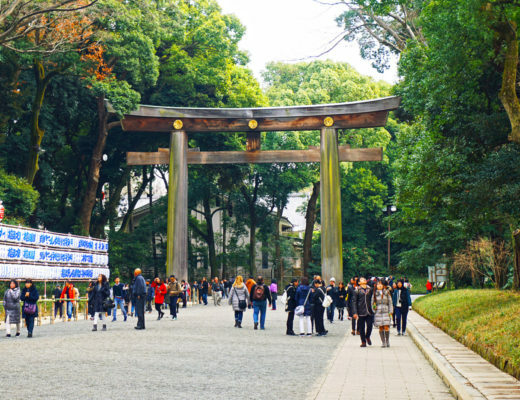 While they obviously exist here, there’s just no space for one in my tiny dorm room. Needless to say, I never realised so many of my favourite comfort foods are made using an oven before coming to Japan. Enter the rice cooker, aka a total lifesaver. Honestly, I just don’t understand how people make rice without it. But for baking cakes? 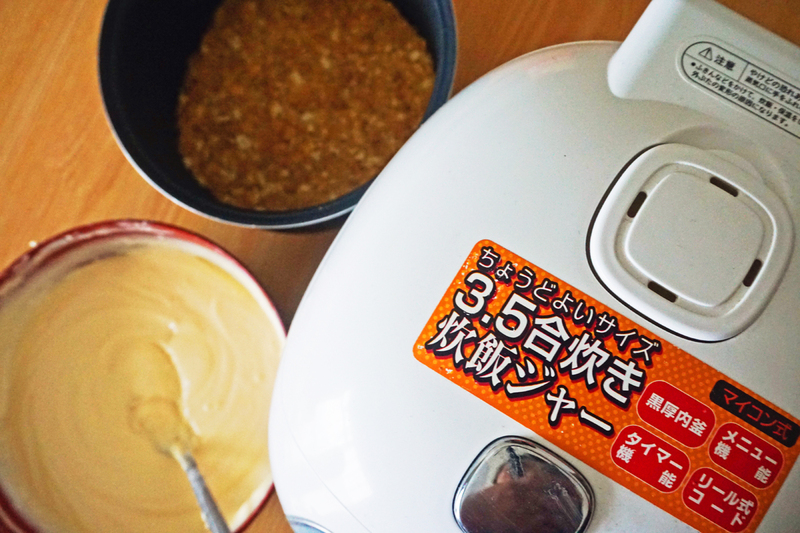 It never occurred to me until a friend mentioned that she dumps hotcake mix into her rice cooker for an easy fix. At that moment knew I had to try it out for myself. 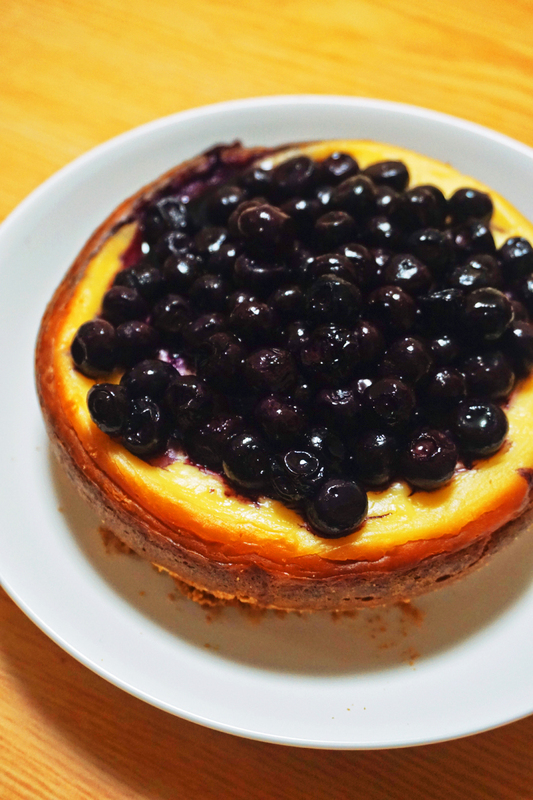 So here’s a recipe for blueberry cheesecake, the rice cooker edition. Enjoy! 1. Take your eggs and heavy cream out of the fridge. Then put the Marie biscuits in a ziplock bag and crush until the pieces become fine. 2. Heat the margarine for 40 seconds in the microwave. Add to the crushed biscuits, then mix until it holds together. 3. 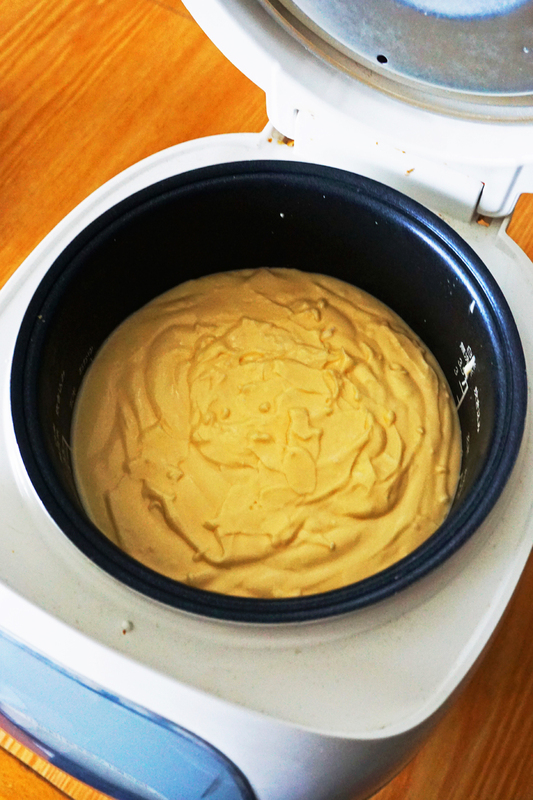 Put the margarine and biscuit mixture into the rice cooker bowl. Then using cling wrap, press it down from the top and shape the biscuit base. Leave in the refrigerator to set. 4. Cut the cream cheese into smaller pieces, then put in a bowl and microwave for a minute or until soft. Whisk until smooth. 5. Sift the sugar into the cheese and mix. Then sift in the flour and continue mixing. 6. Mix the eggs before adding to the mixture. Add the heavy cream and lemon essence and stir. 7. Add the mixture over the biscuit base and let it settle. Then place the bowl in the rice cooker and turn it on. 8. When the first rice cycle is done, check if the cake comes loose at the edges. Also, check if the centre is cooked with a skewer. If not, simply start as many rice cycles as you need (in my case it took two cycles). 9. When done, leave the bowl to cool at room temperature. Then put the cake in the fridge. 10. Prepare two plates. Flip the cheesecake onto one plate, before transferring onto a serving plate. 11. Wash your blueberries or let them defrost, depending on whether you have fresh or frozen ones. Put in a saucepan with some sugar and simmer on low heat until they turn soft. 12. 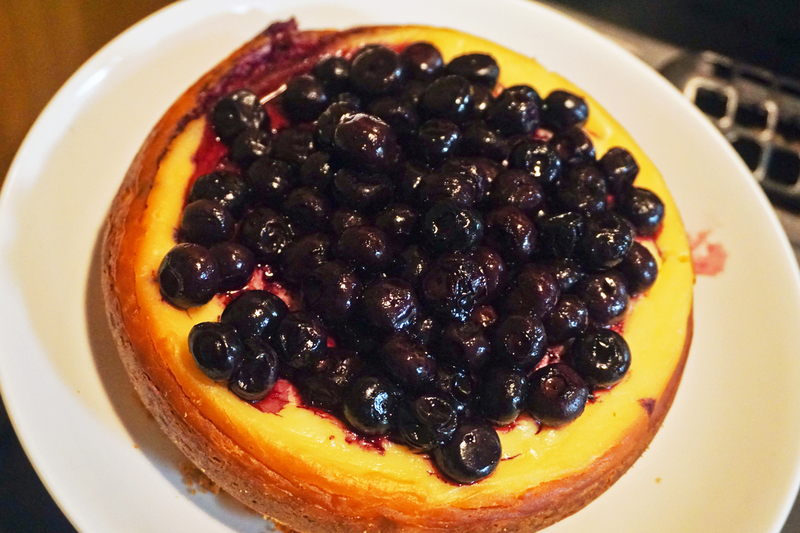 Arrange the blueberries on top of the cheesecake, then refrigerate until ready to serve. I used blueberries to top my cheesecake, but anything goes really. In fact, the original recipe calls for strawberries and jam heated in the microwave. 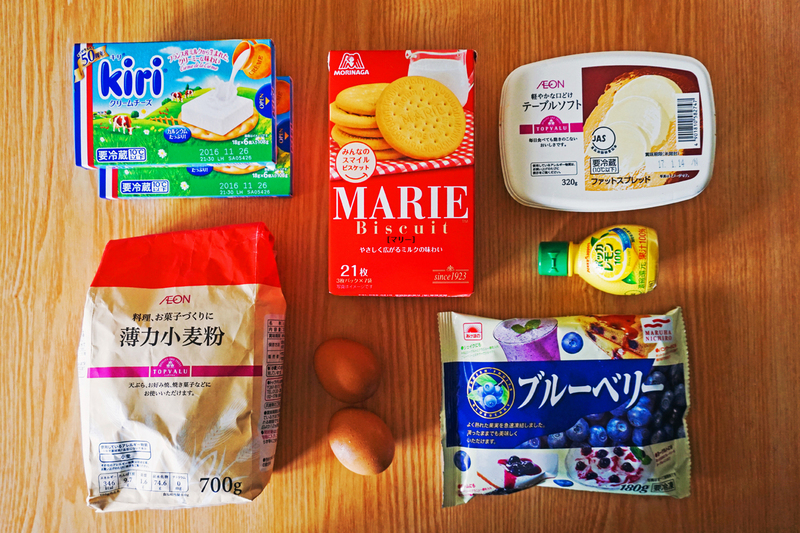 Also, if you can’t get your hands on Marie biscuits, don’t fret! They’re pretty much identical to the Arnott’s milk arrowroot biscuits, although I’m sure any other cookie will work too. And there you have it, a super delicious cheesecake that doesn’t require an oven! The biscuit base was perfectly crunchy while the cheesecake was moist, probably from the steaming effect of the rice cooker. Anyway, I think this method of cooking has me converted. I’ll definitely be on the lookout for more rice cooker recipes from now on!